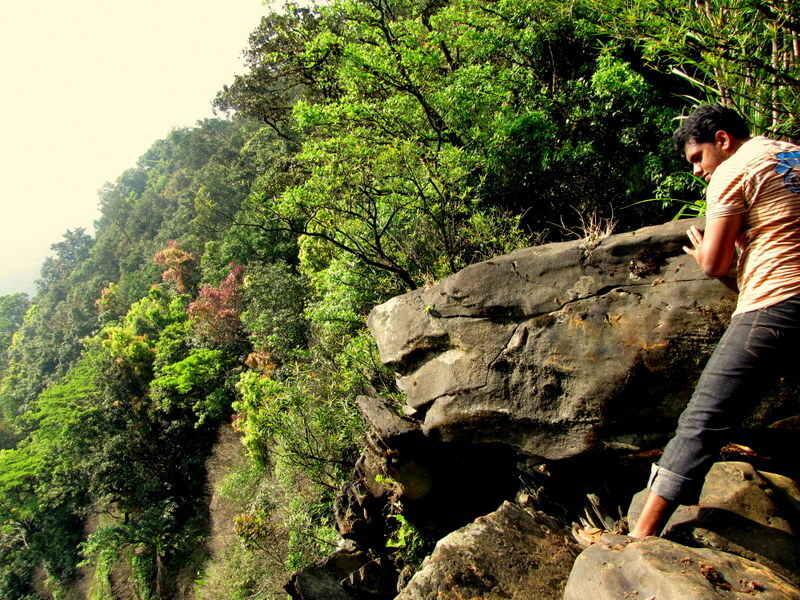 On the 15th of June (one day before my birthday) we left for this trek with Pratap Sikdar of BASC. This was supposed to be a preparatory trek for the Himalayan trip during which we could finally meet everyone and get to know the team before going for the big one. 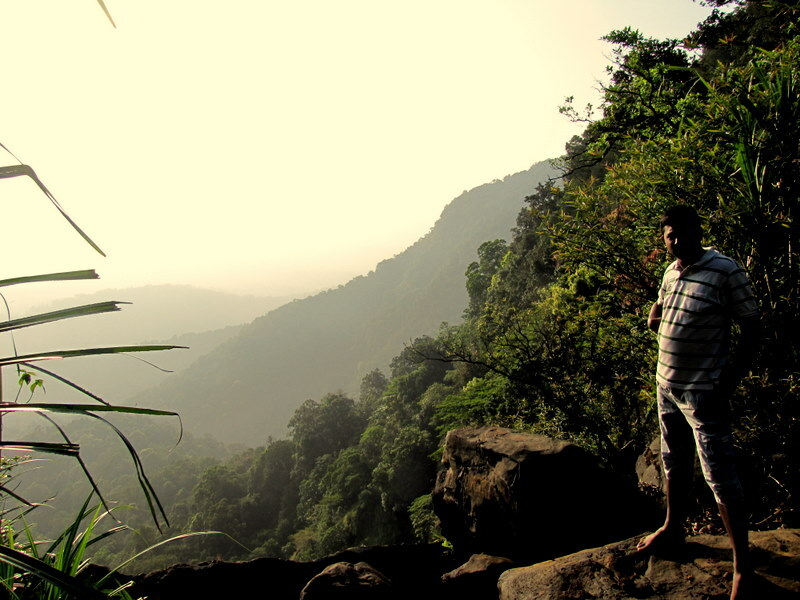 The plan was to visit the Basavana Baayi and the Belligundi Water falls. 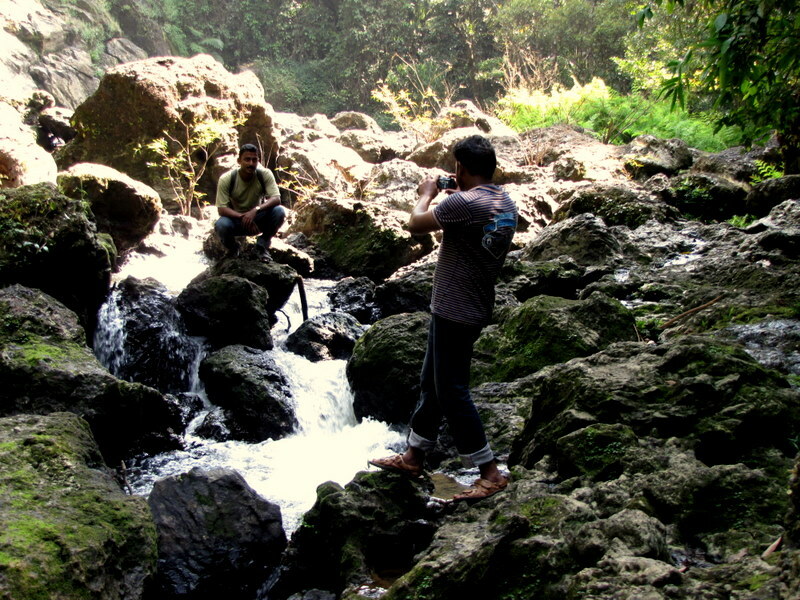 It was planned to be an easy trek so that we could all simply relax and enjoy the beauty around us.. The first day was more like a walk in the countryside. 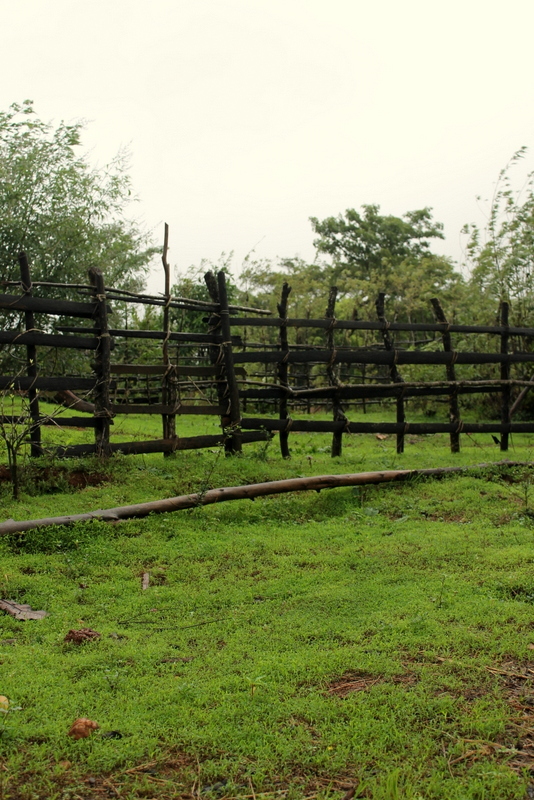 It was drizzling throughout the trek and the walk through the villages and the surrounding woods was very relaxing and refreshing. 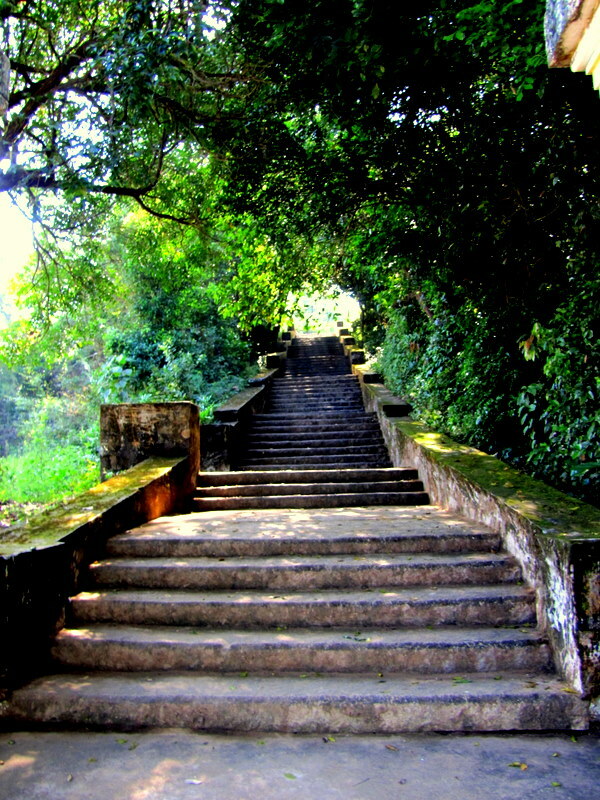 Especially after the hustle and bustle of Bangalore and the uncomfortable night spent travelling in the tempo. 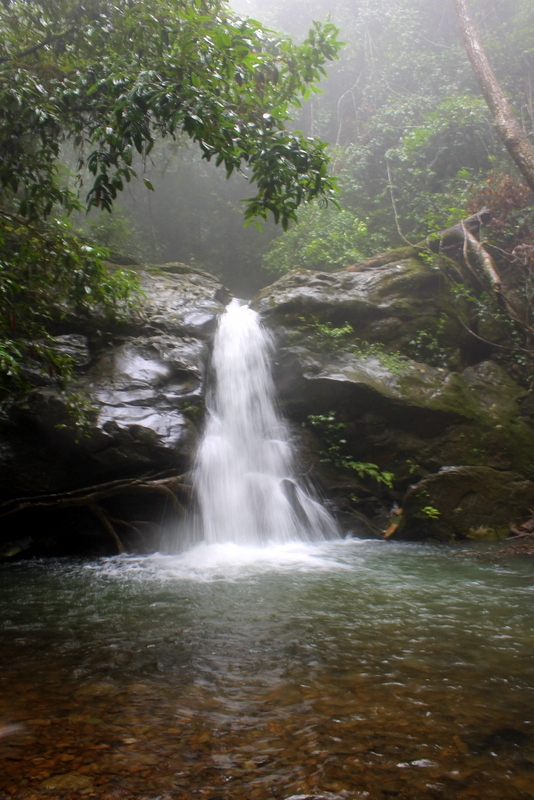 The day’s trek culminated in a dip in this beautiful and discreet falls. 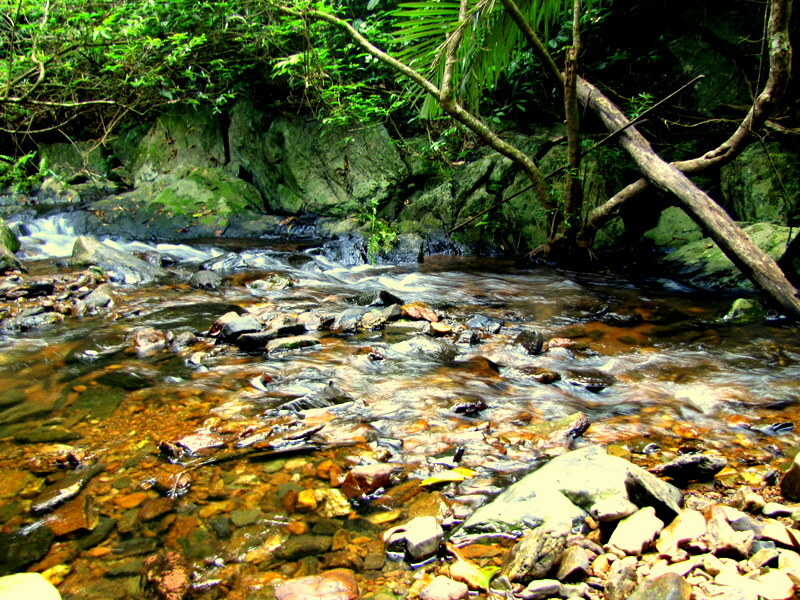 The final stretch before the falls was riddled with big slippery boulders covered with slimy algae. I had an exciting time negotiating them. 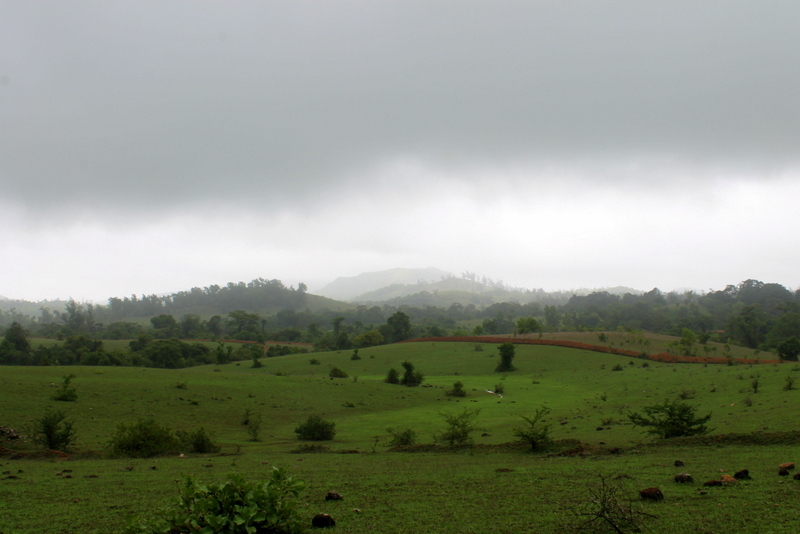 Trekking in the western ghats in the monsoons is a very unique experience. There are so many nice and not-so-nice things about it that make it a such a unique experience. We reached the home where we were supposed to halt for the night by around 1 in the afternoon. From then on it was relaxing, eating food, reclining on the verandah and reading for me. 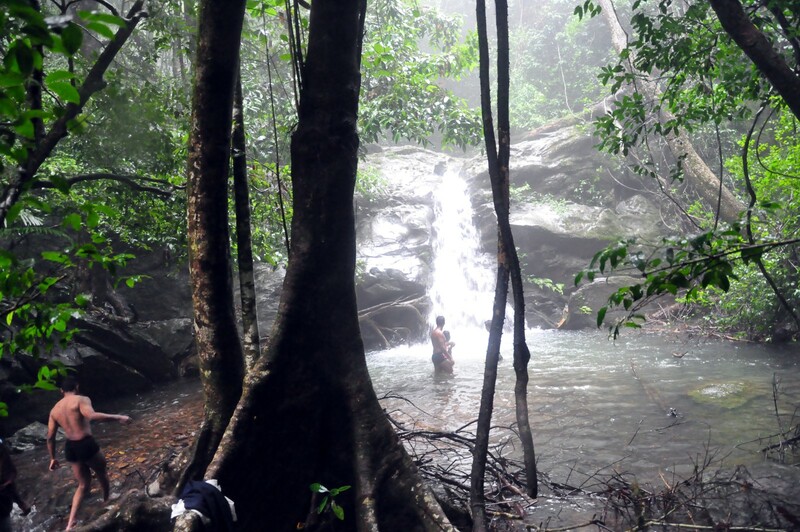 On day 2 we went deeper into the forest and the trek ended with us witnessing the Belligundi water falls. 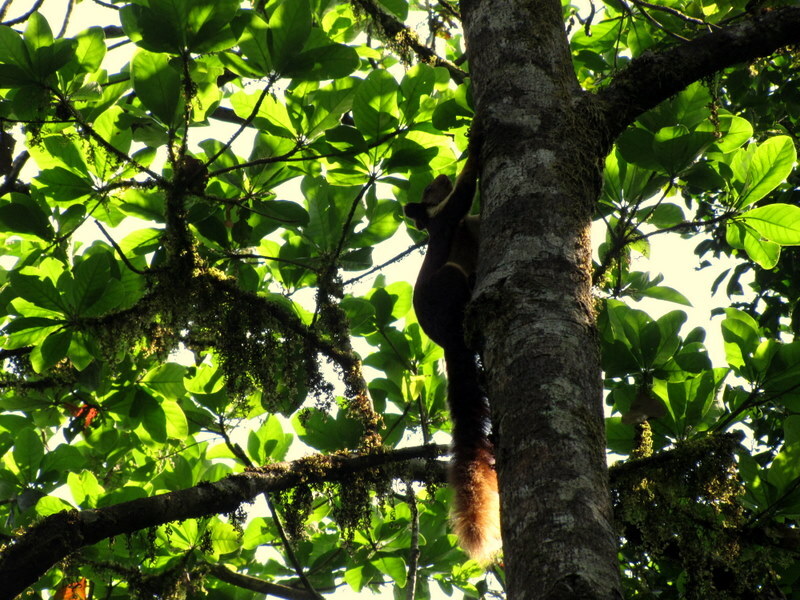 This trek was through really thick forests and the final stretch was simply amazing. Unfortunately, the whole area was saturated with mist and water droplets from the raging falls and my camera was completely fogged up. So, couldn’t manage to get any pics. I had a wonderful time there. After returning we again had a meal at another home. 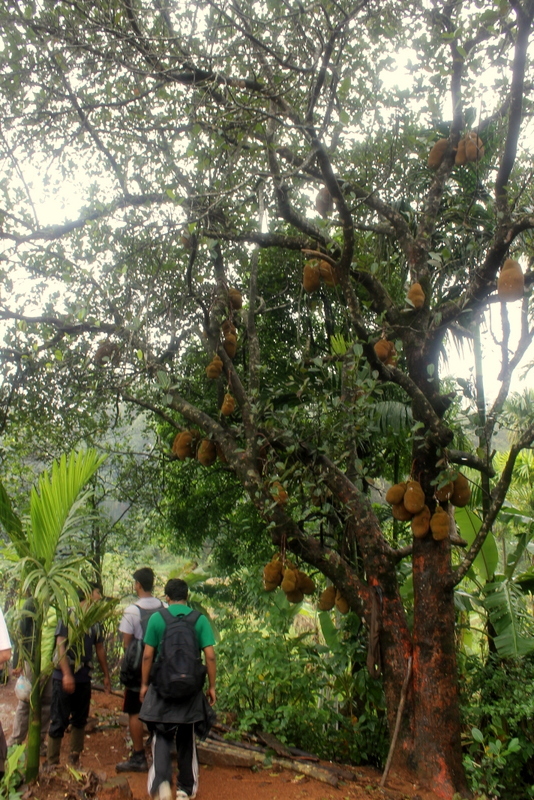 This was followed by a dessert of jack-fruit that was freshly plucked for us. The countryside was so charming, the food so tasty and the weather so pleasant that I felt it harder than usual to say goodbye to the place. 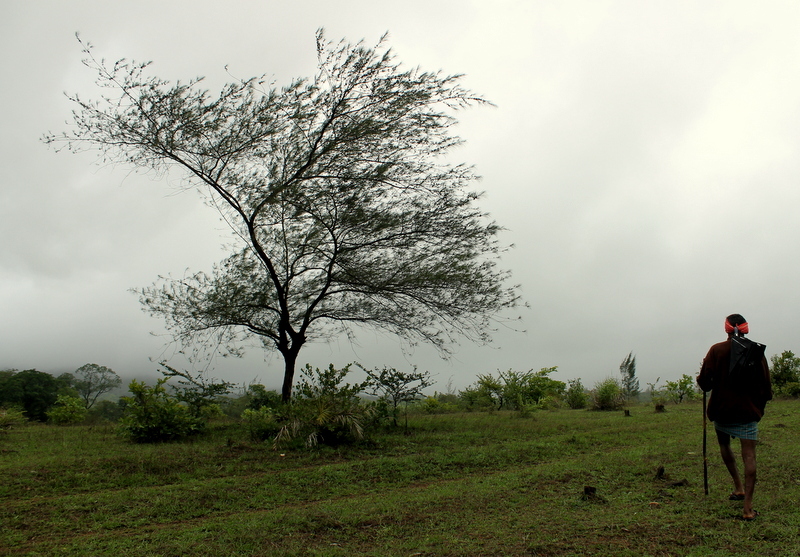 Last week, I saw an article in The Hindu about how Hulikal had overtaken Agumbe as the place receiving the most rainfall in South India. 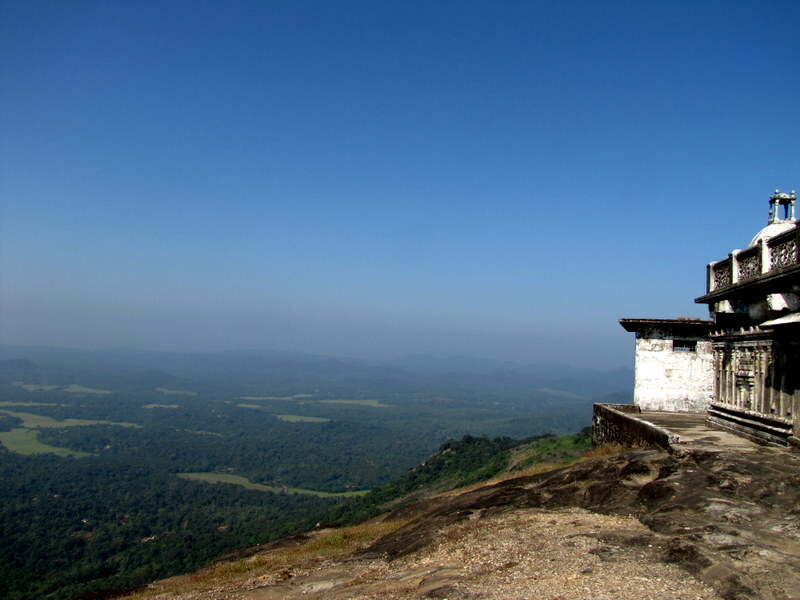 I had heard a lot about Agumbe(famous for the King Cobra) and a wish to see that place where the Malgudi Days(Serial) was shot was always there in my heart. I decided that last weekend was a good time to go there. Immediately, I called up KP and asked him whether he wanted to join me. After that I did a little bit of research online and booked the bus tickets. 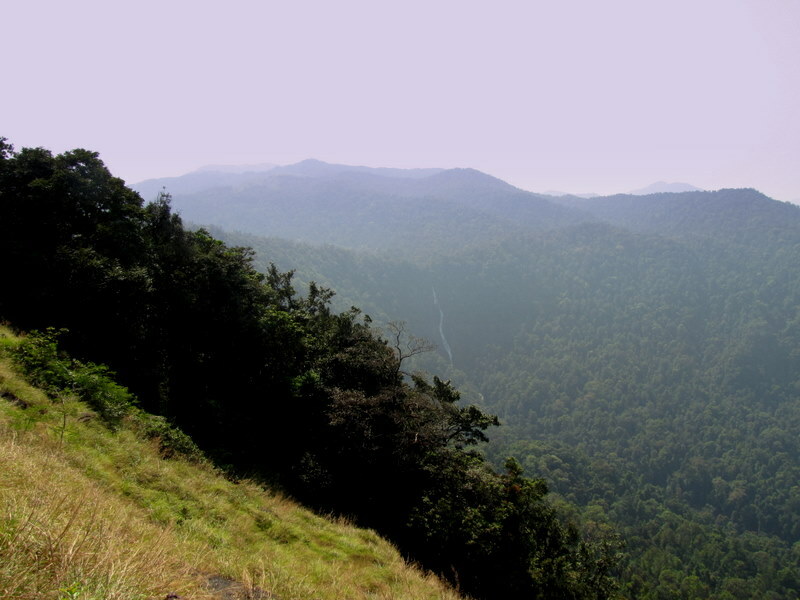 There is only one direct bus to Agumbe from Bangalore and back. On Friday, Febin too joined us and I got a ticket for him too. It had been a long time since I had gone somewhere and I was pretty excited about the trip. After trawling the blogosphere I came up with the name of one Kasturi Akka who arranges stay and food for people who visit Agumbe. I called the lady up and arranged for our weekend stay. On Friday night, Febin managed to get us an entry-level SLR and I was very happy about that. 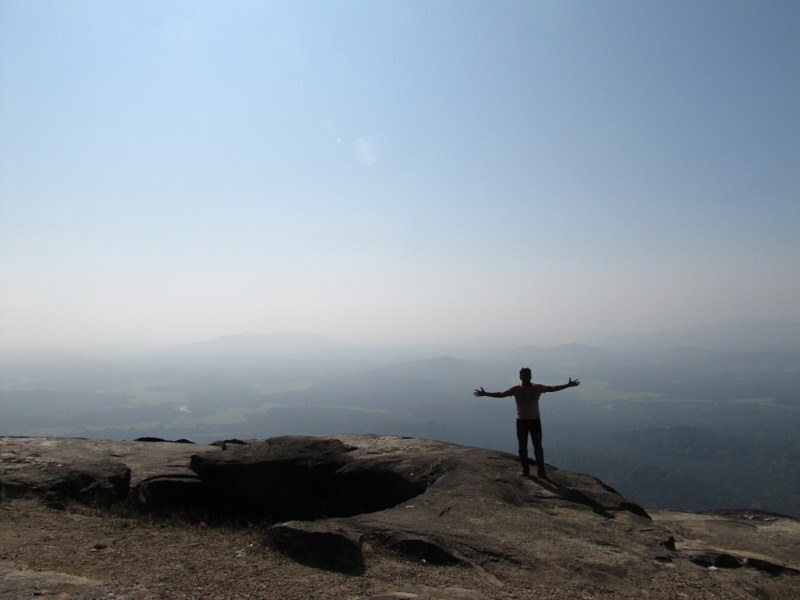 The bus started at 10 and reached Agumbe by around 7. It was very foggy and cold the morning we got there. 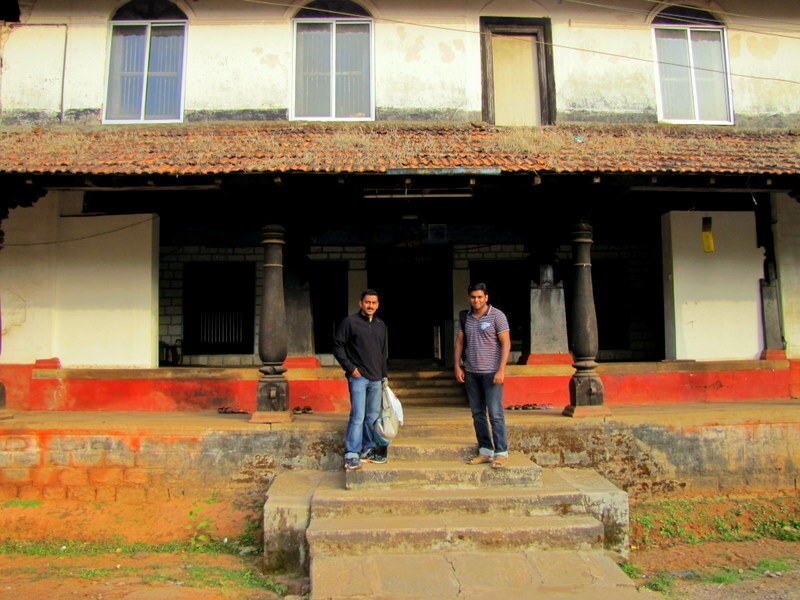 We quickly made our way to Kasturi Akka’s house which kind of defines Agumbe as it is one of the largest structures there and almost certainly the oldest. I was pleased to see that the place was not very touristy and everything was calm, quite and sleepy(just as I had imagined it). 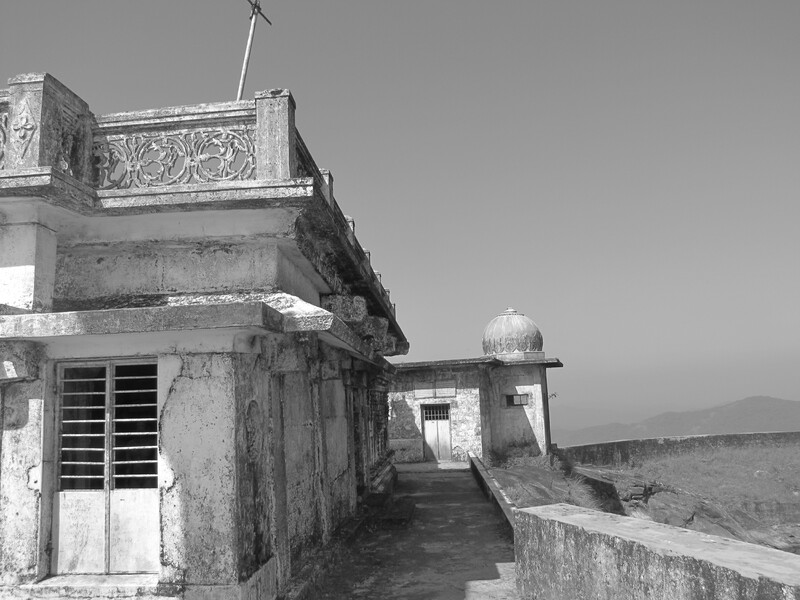 The house was the one in which Malgudi Days was shot. It had that aura that comes with age and the gentle character of its inhabitants. We learned later that it was around 127 yrs old. 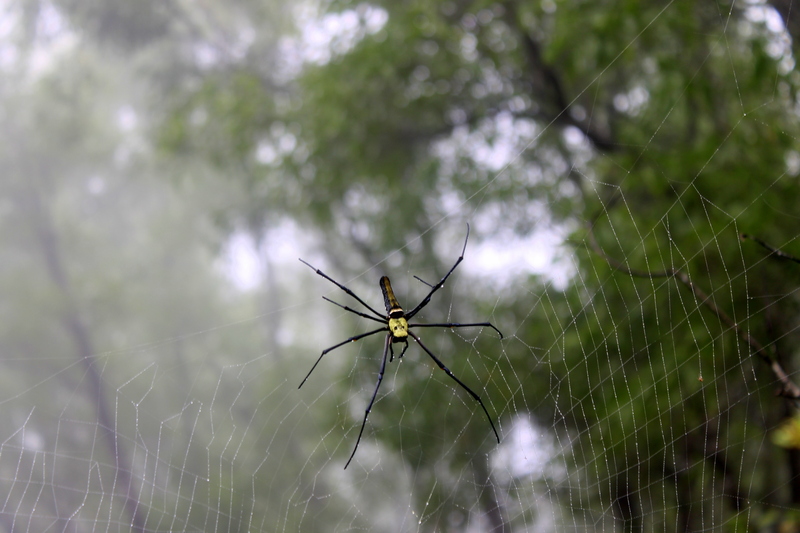 We went inside and were treated to the sight of a big nadukalam and living quarters surrounding it. We went and met Kasturi Akka who seemed to be the head of the family and introduced ourselves. 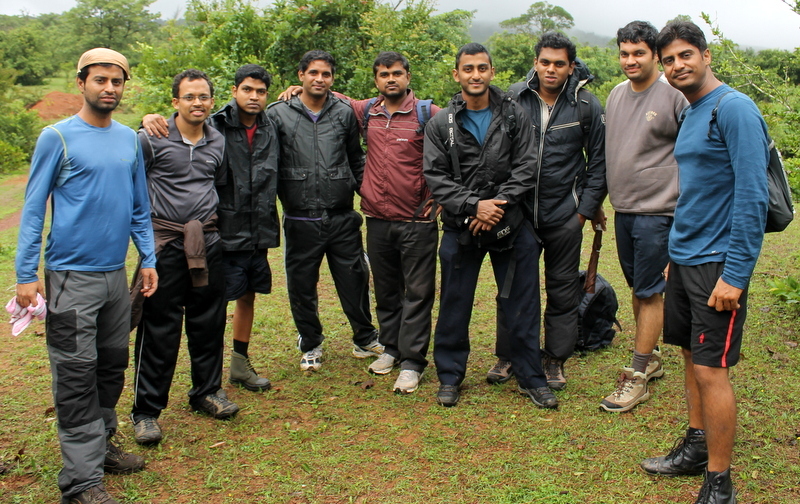 After freshening up we had a breakfast of idlis and then set out on our way to the Barkana Falls view point. We got to the start of the trail by Auto. On the way we had to register ourselves at the police station which is near the Agumbe stand. We started to walk along the trail. It was a good refreshing walk and we passed a couple of meadows and small streams on the way. 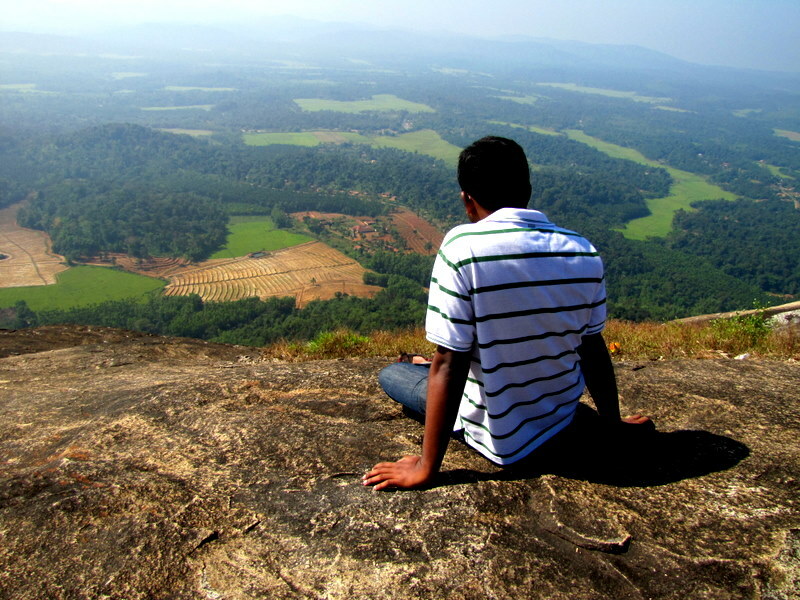 After a few kms we came to the view-point. We could see Barkana Falls from a distance and we could see that it was pretty impressive. Also, it was deep inside the forest . 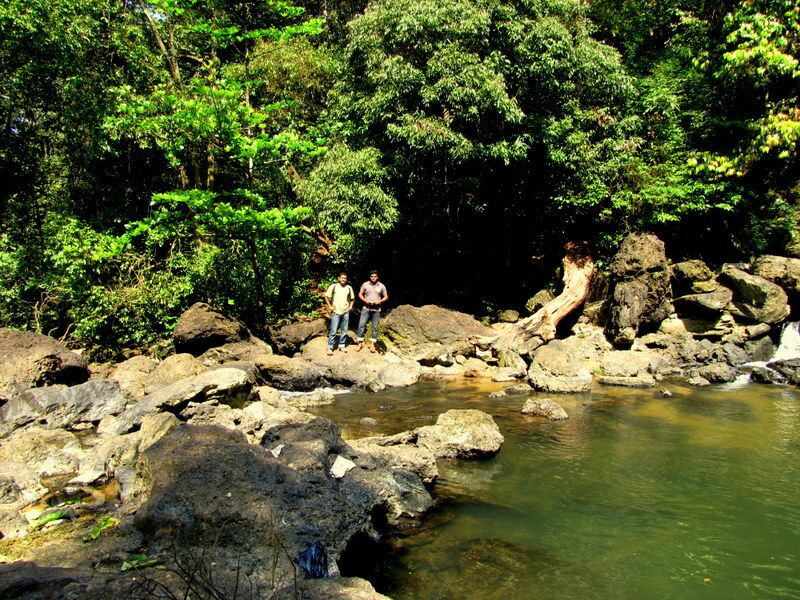 we had initially thought that the trail would take us to the waters. We were a little disappointed when we saw that it was just a viewpoint. After that, we did something incredibly stupid. 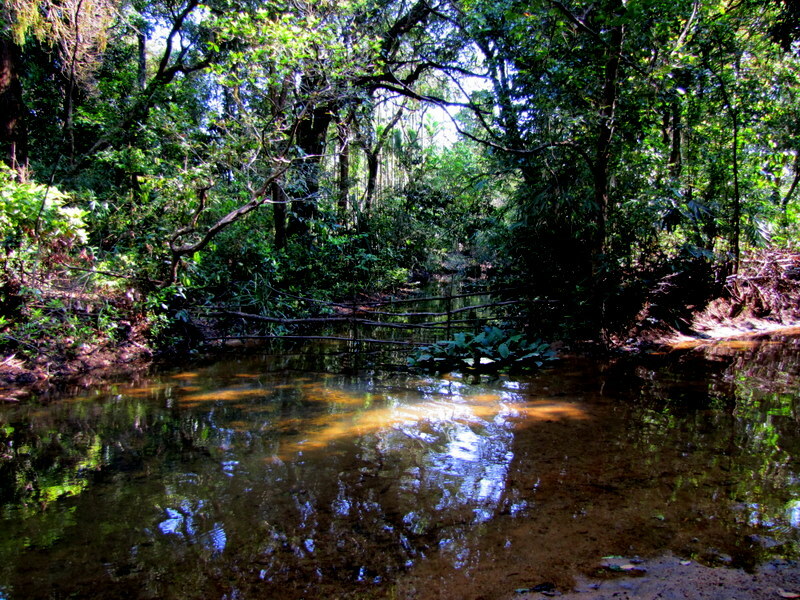 We thought that if we walked through the forest, we could get to the waters. 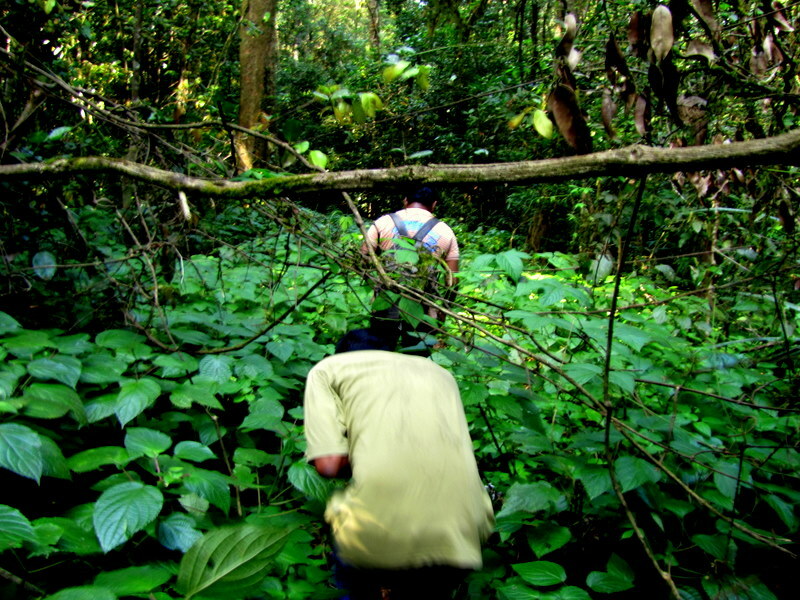 After trying that for around 1 hr, we realized that we were disoriented and the forest was too thick to proceed. KP kind of saved our lives by leading us out by following some branches that he had the good sense to break on the way. On the way back, suddenly what must have been around a million crickets suddenly started going crick-crick-crick. I never imagined that crickets could be so loud. It drowned out every other sound and we couldn’t hear even ourselves. It was a little unsettling coming on top of the fact that we were a little lost. a something KP spotted on the way. Any know what it is? But, thankfully, we made our way back to the trail and then back to the main road. 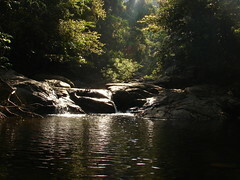 On the way back, we took the diversion to Jogigundi Falls. 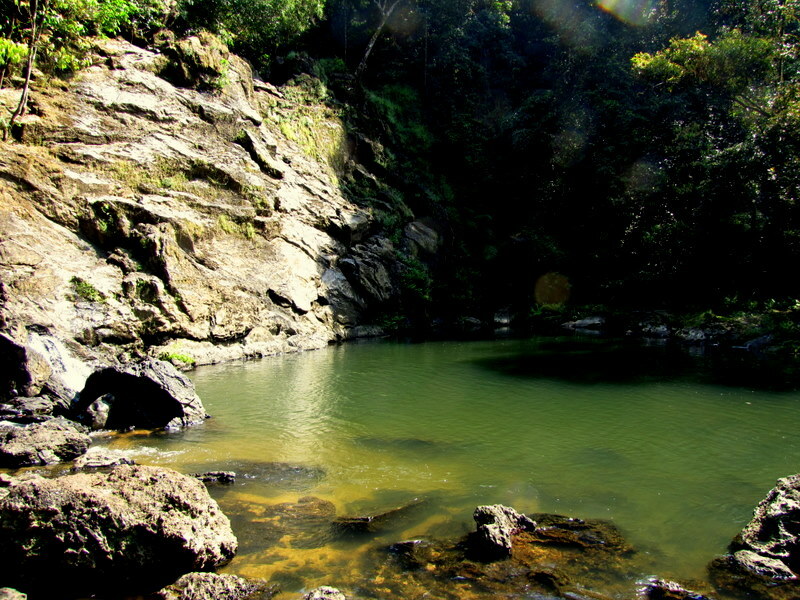 After a short trek we got to the base of the falls which looks like a calm swimming pool. 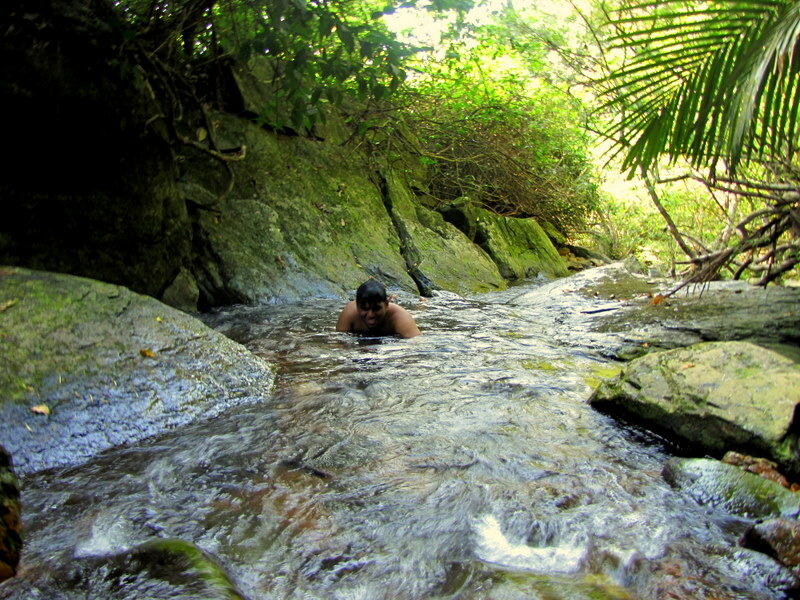 We had a pleasant and refreshing dip in the water. Afterwards we made our way back to the house and had a quick-lunch. After lunch we went on a walk to the sunset point nearby. It was along the state highway and all the vehicles passing by stop there. So, it was very crowded. We hung about for a while and then returned. After bath and lunch we were talking to a family member. He said that there was temple nearby which was around 800 yrs old. We were interested and we went with him to the temple. It was one of the best memories of the trip for me. There was some elaborate pooja going on and I too walked along with a dude who was holding up some statue around the temple a few times. There were pretty lights and clanging bells and it was a nice experience. It was then that I realized a profound truth. No matter which God you believe in or which religion you belong to there is something deeply special and magical about a place of worship. It is this. The closed eyes and bowed heads all around you gives you such a great opportunity to check out all the pretty girls gathered there at your own pace. Being surrounded by so much natural beauty was truly uplifting. When the pooja got over, we got some stuff to eat and a beetle leaf and areca nut to chew. Afterwards we walked around in the night and talked about our day and plans for the next day. The next day after breakfast, we caught a bus to Gudikere. From them we tried getting an Auto to Kundadri circle. But there were none. 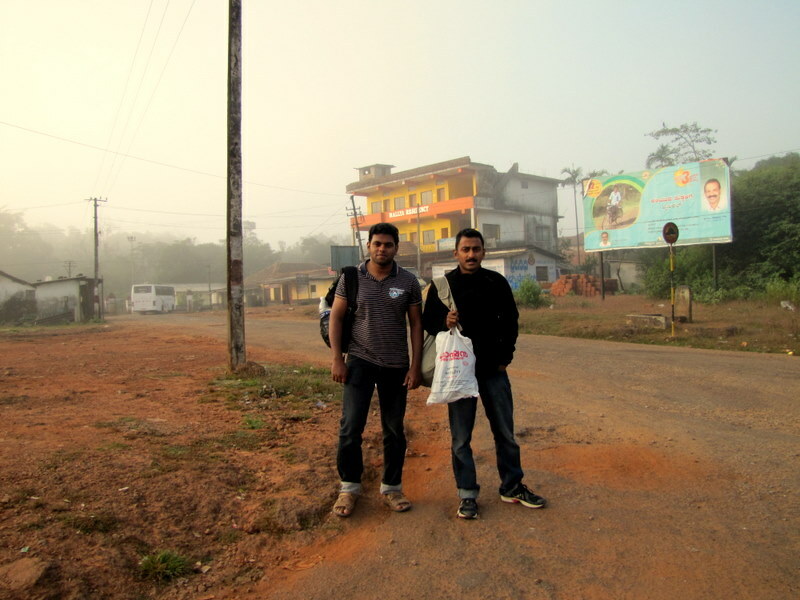 Luckily a guy came along in a van and he gave us a lift for 100 rupees. The place was around 8 kms from Gudikere. 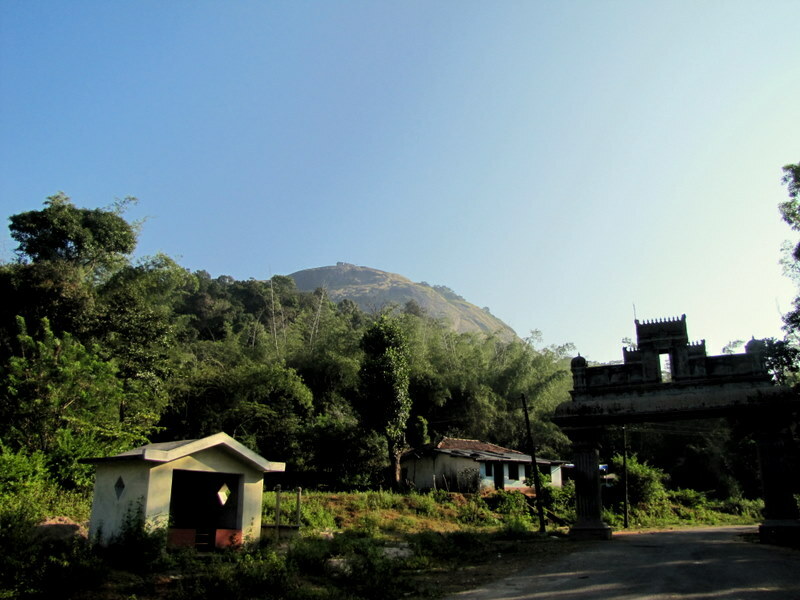 From the gate, we could see the big mass of rock that Kundadri is and the little temple perched on top. There is a road to the very top. We walked along it and after a long climb some sections of which were pretty steep, we got to the top. The view from there is breathtaking. 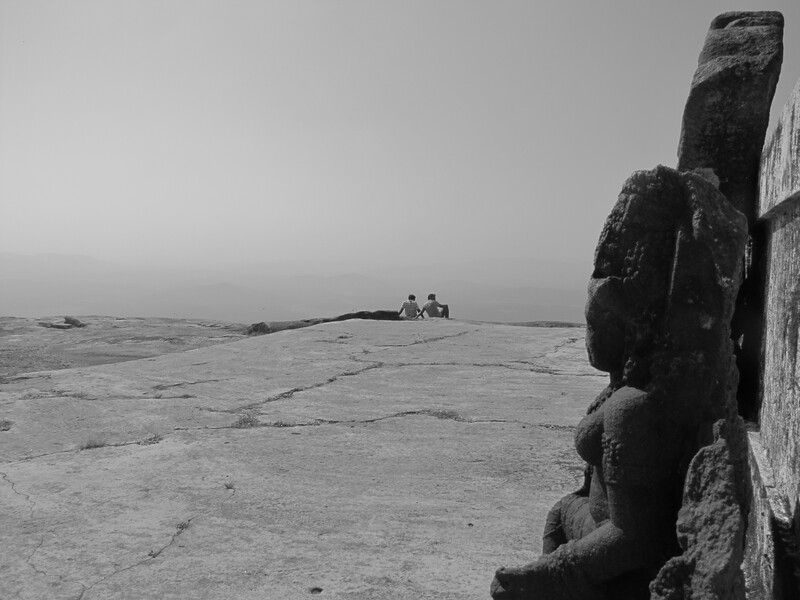 More than the view, it’s the solitude, peace and the calming influence of the unobtrusive temple that strikes you. We relaxed for a while and took photos of the surrounding vista. 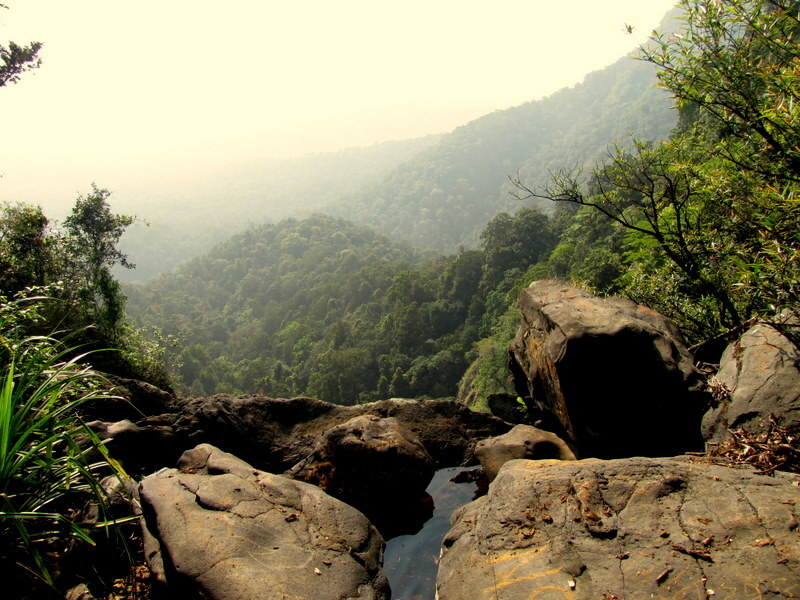 I noticed that in Agumbe, there was very little tourist crowd even in easily accessible places and I soaked in the enjoyable solitude as best as I could. 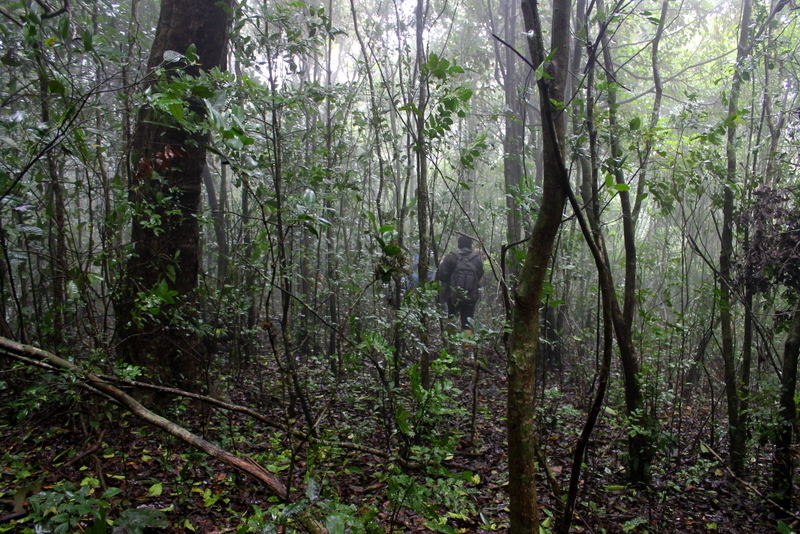 We walked back down and on the way we took some shortcuts through the forest cover and shorted some turns in the road. We were just in time for the 11:15 bus from Kundadri circle to Gudikere. 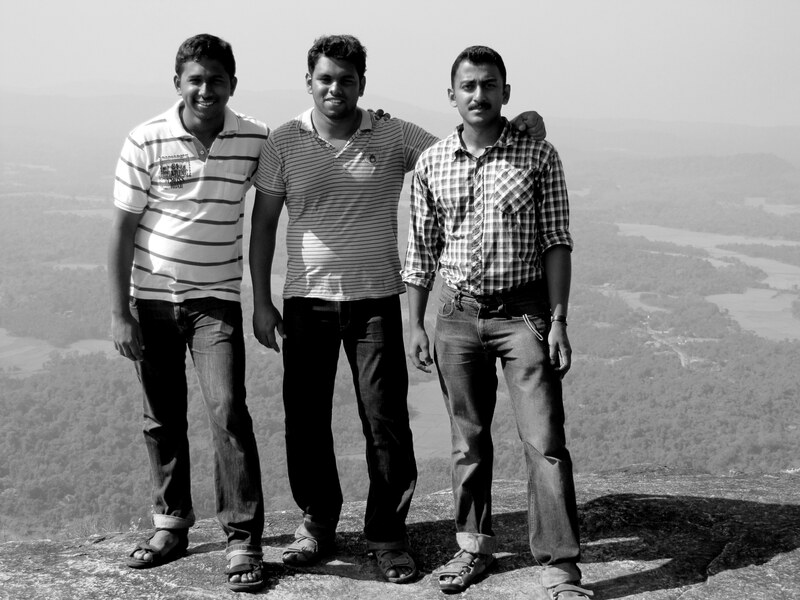 From there we got back to Agumbe. After lunch we set out for Onake Abbe falls which was the highlight of our trip. 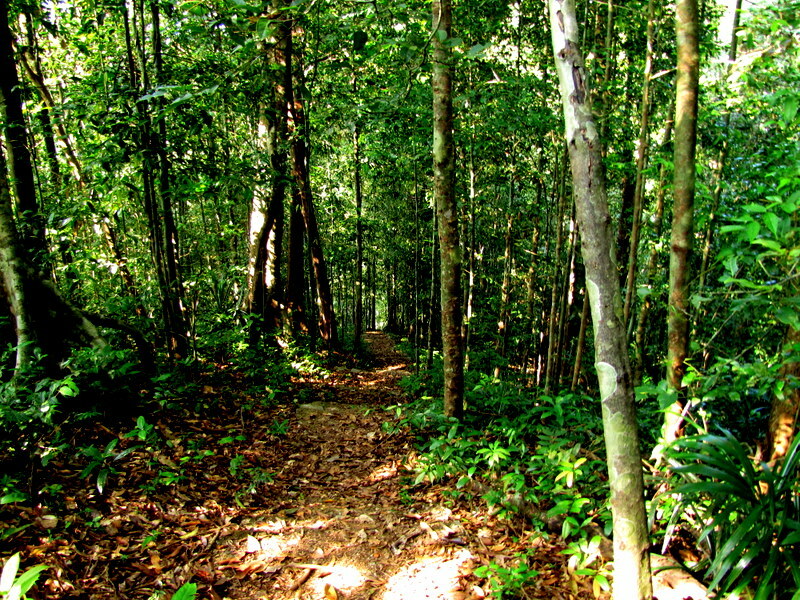 The trail is through a forested area. 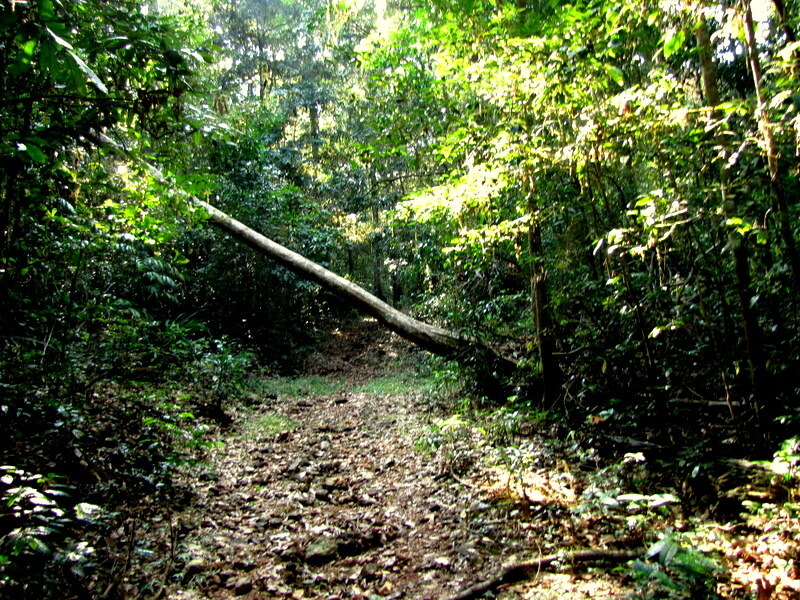 In Agumbe, vegetation is very prolific because of the heavy rains and because of that trails don’t remain very clear. The walk was an extremely pleasant one and I thoroughly enjoyed the greenery and cool refreshing air which reminded me of Kerala. In places plants had covered up portions of the trail and while walking through them we were very wary of snakes. At the end of the trail there were steps cut into the rock which lead us down to the falls. As we were walking along the trail we could seem some light to our left. We had thought that we were walking along the side of a road. But when we stepped out of the foliage, to our delight we realized that we were at the very mouth of the falls and there was a a breathtaking view from there. The place was completely clean and there was no one there. It was a dream come true for me. 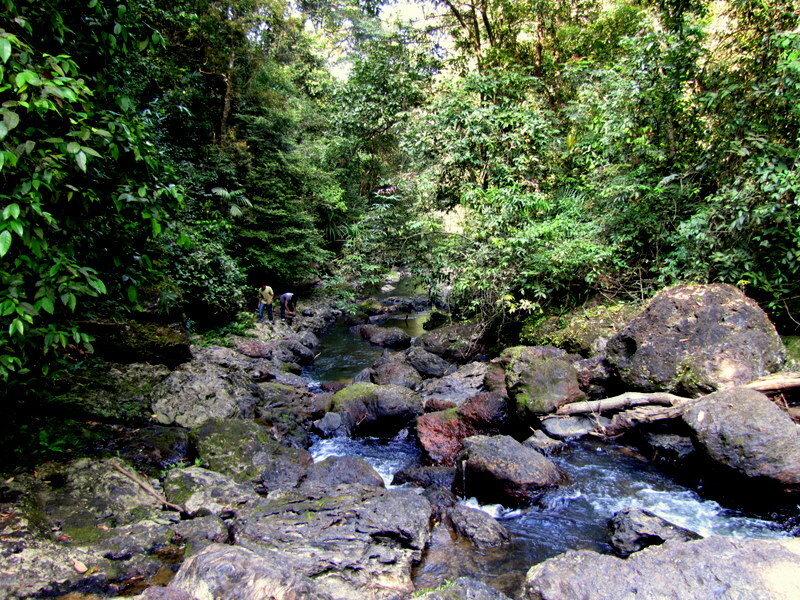 We walked along the meandering stream that made the falls, took a lot of photos and then had an enjoyable bath in the ice-cold water. This was supposed to wrap up our trip and relax our aching bodies. 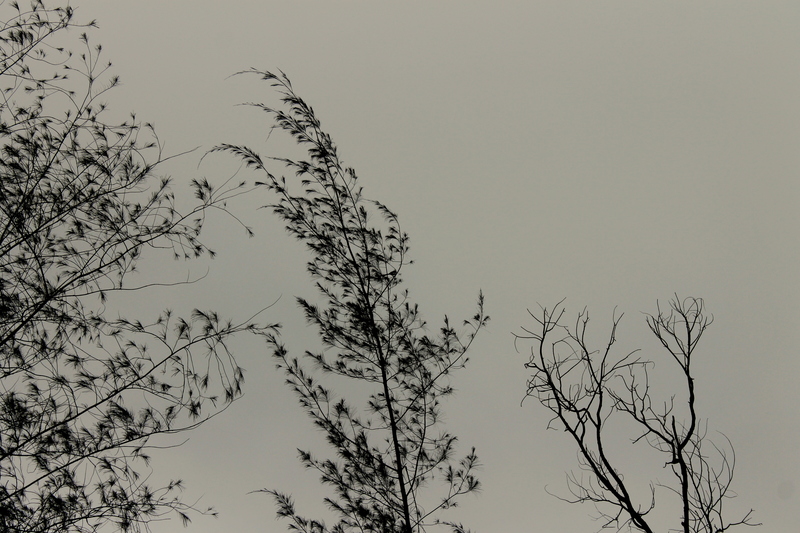 We stepped out of the foliage and this is what we saw! crystal clear waters and only us to enjoy it! KP is like a mermaid.:-). The moment he touches water, he loses the ability to stand on his two feet and starts slipping and sliding around. Swimming would have been a good option if he knew how to. So hanging on to rocks for dear-life is what he generally does. After cooling off we hurriedly walked back as it was quickly getting dark inside the tree cover. We would have loved to witness the sunset from there but did not think it safe to do so. After washing up we went out for a walk since the bus was supposed to be at 10. We came back at 7:30 and Kasturi Akka’s son reminded us that it was time for dinner and that we better hurry. I was a little surprised. I told him that the bus was only at 10 and that gave us plenty of time for dinner and stuff. He then told us that there is only one bus to Bangalore and it leaves at 8. We were shocked to hear that. We quickly rushed up to our rooms and packed everything, went down, gobbled up some dinner and KP ran to the bus station. Just as he was reaching there the bus was starting to move out. It was a little bit of unwelcome excitement. But, I later realized, it would have been uncharacteristic of me if everything had gone smoothly. So, yeah, had a pleasant trip back home. 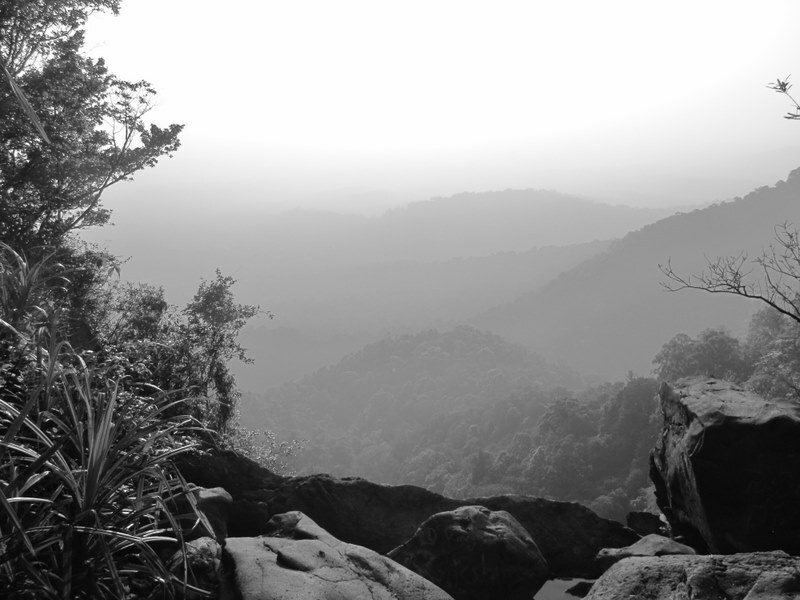 Looking back, what most touched me about Agumbe was the old world charm, the slow calm and simple life of its people and the warm and genuine hospitality of our hosts. We were treated like family and it felt truly special to be in that house bursting with stories to tell and nothing to hide.